I’ve been working on a couple of major parts to the glove recently: the air compressor and the thumb exoskeleton. The compressor needs to be small enough and light weight enough that it could be strapped to the user’s upper arm, though when wearing a pair of gloves it makes more sense for the compressor along with the air tank and battery to be in a small backpack, bum bag or shoulder bag. First I tried a tiny 6V motor which definitely met the ‘small enough’ requirement but wasn’t powerful enough to get enough pressure in the tank. I’ve since switched to a relatively larger motor which runs at 12V, and this is giving promising results. I can use bigger pumps and have a design to use 2 to 4 pumps on a single motor. The human thumb is much more complex to wrap in an exoskeleton than the fingers. Each finger 4 degrees of freedom (DOF): 3 flexion/extension joints and 1 adduction joint, with the adduction joint only having about 20 degrees of motion. I have a working prototype for the 3 flexion joints and plans for supporting adduction, though this will be done after the wrist/forearm exoskeleton. 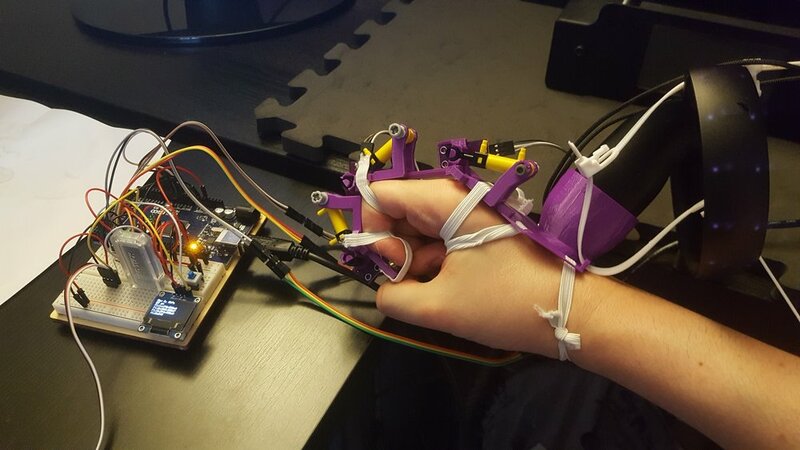 Currently the VR tracker is mounted on the back of the hand but I plan to move that to the forearm and track and apply force to the wrist joint. This allows for physical effects like pistol kickback and provides more space for the electronics and pneumatics. The thumb has more degrees of freedom - it is generally accepted as having 5 DOF. These are roughly equivalent to the 3 flexion and 1 adduction of the fingers, plus 1 degree of freedom for pronation-supination (the rotation which allows the thumb to touch the palm and other fingers). The positioning of the joint at the base of the thumb makes it difficult to wrap in an exoskeleton, unlike the fingers where the palm and back of hand provide a good ‘scaffold’. I’m still iterating the design but here are some images of where it is at the moment.